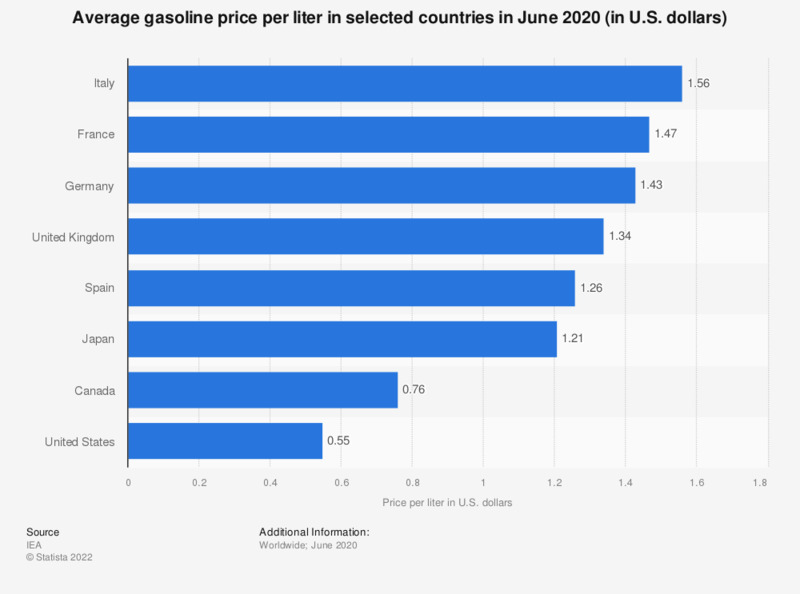 This statistic shows the price of gasoline per liter in selected countries in March 2019. The prices concern unleaded premium (95 RON) for France, Germany, Italy, Spain, and the United Kingdom, and regular unleaded for Canada, Japan, and the United States. In March 2019, the gasoline price per liter in the United States stood at 0.67 U.S. dollars per liter. In Italy in the same month, the price stood at 1.75 U.S. dollars. Average end-use total prices in U.S. dollars. Unleaded premium (95 RON) for France, Germany, Italy, Spain, and the United Kingdom. Regular unleaded for Canada, Japan, and the United States.